I know there are a lot of different specialty breads out there to make. My cookbooks are full of them, not to mention the internet. Zucchini bread, carrot bread, date nut bread or pumpkin bread are all available. But I only love one and that is BANANA BREAD. We have a recipe that has been in our family forever and I will share it with you in an upcoming blog. Banana bread is very special to me. When I visit my mom or sister they always bake me a loaf because they know how much I like it - warm with butter. Now, a silly side story – my sister and I have an ugly troll doll we have passed back and forth for years. She once wrapped the troll in foil and baked it in the center of a loaf of banana bread and mailed it to me from Colorado to Cincinnati. Very, very funny. We have quite a few “troll” stories. 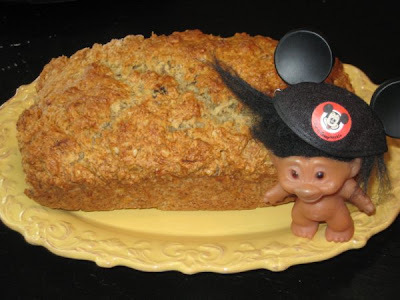 Bonnie now lives in California and in the photo of the banana bread below you will see the troll – after a visit to Disneyland. Banana bread means love and comfort to me and I hope it will do the same for you.